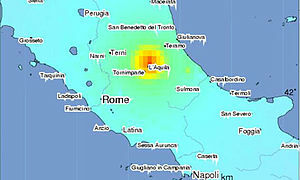 Seismologists in Italy are being tried for manslaughter in the deaths of hundreds of people killed in an earthquake. Truly, when I saw this, I thought for sure it was an article by The Onion, but alas, it is not. Essentially, these scientists are being charged with not being able to predict the impossible to predict. The Italian government should charge the pope if that’s the case, as they are a Catholic country, and doesn’t the pope speak directly to god, who in turn controls everything? Seven scientists and other experts were indicted on manslaughter charges Wednesday for allegedly failing to sufficiently warn residents before a devastating earthquake that killed more than 300 people in central Italy in 2009. Defense lawyers condemned the charges, saying it’s impossible to predict earthquakes. Seismologists have long concurred, saying the technology doesn’t exist to predict a quake and that no major temblor has ever been foretold. Previous PostPrevious Thailand’s king is an Idiot – American faces 15 years in prison for linking to a webpage.